Only The Brave collection by Diesel receives another edition in 2012, which arrives in sale in March. 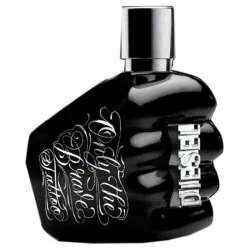 The new Only The Brave Tattoo is available in characteristic flacon (glass fist), in dark shades, with inscribed Only The Brave Tattoo in "La Graffiti" style. Only The Brave Tattoo is composed of apple, opening the composition with its zest. A heart comprises sage and Bourbon pepper, while a base features amber-wood tacts, benzoin, tobacco and patchouli.